Things have been hectic around here this week – the cyclone aftermath, 3 days of school cancelled, trying to not go crazy with cooped up kids who only wanted to go outside, application forms to fill out for the immigration process, extra cleaning and laundry to catch up on from the long power cuts, Lila’s Halloween party and judging the sweets contest (next post), a birthday party to attend, parties to plan, and today Logan just had to come down with some tummy bug and spend the day throwing up bile. I’ve also forced myself to get back into my morning exercise after a time of not doing it, so by the evening I’m so tired that all I want to do is chill in front of the t.v. and rest my body and brain. But there isn’t much time to rest. I have to plan Logan’s school birthday party for this friday. That means baking and getting some small giveaway gift for the other children. Giveaways are a custom here, and so far Logan has gotten something nice from each of his classmates parties so, though it is optional, I feel obligated to give something. Something small, but still something. Then Glad’s mom arrives Saturday. She is coming for Logan and Scarlett’s birthdays, and hers is around the same time so we will celebrate it as well. Sunday is Logan’s birthday and tuesday is Scarlett’s. Tuesday is also Diwali so that means more holidays. And monday we are spending at the passport office while we do the paperwork for the kids passports. I’ll be doing good to get a chance to sit, let alone blog. 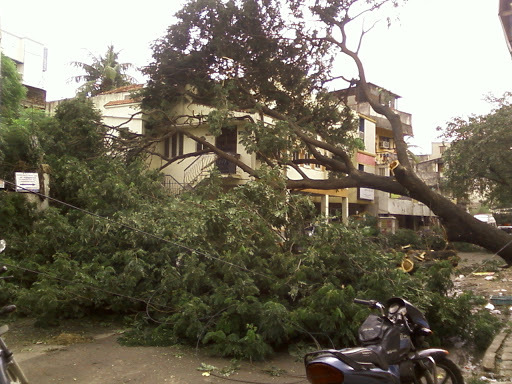 Ok, well, the cyclone mainly caused damage to trees, at least in our area. One huge one fell just down the road, and several fell at our local park. I think there may have been a minor quake as more than one tree fell in such a way that I’m sure it couldn’t have been the storm. We didn’t seem to have winds strong enough to topple trees, at least here away from the beach. (There is currently an oil tanker on the popular Marina Beach that the storm swept ashore.) Our local park is still flooded and the sand in the playground won’t dry; it just isn’t warm enough. So I’ve been having the kids run around the jogging path instead of going to the playground. The massive tree that fell. The roots were under cement and that was ripped up, as was the entrance to the house it was in front of. 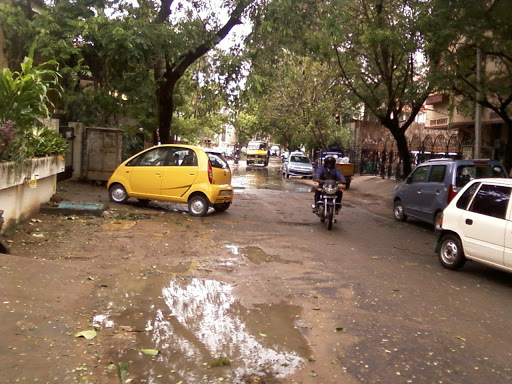 This is the bottom of our street – it’s a complete river during the rains. 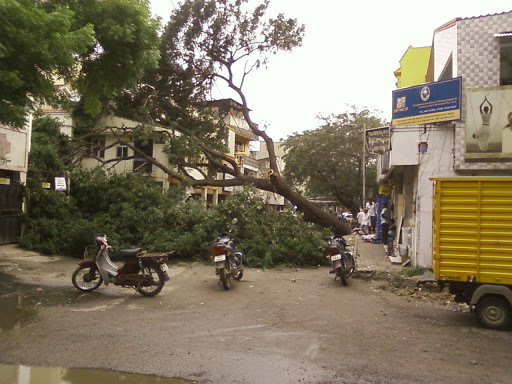 We had one night where the power was out all night, when that big tree fell. It tore down some power lines as well as smashed some small buildings that were directly opposite it. Anyway, because the lights were out we had candles lit. Not so safe with kids, I know, but we don’t have a battery lamp or an inverter. They have learned to be careful. At bedtime I left a candle burning in the hall between our bedrooms, because the kids can’t stand the house being pitch dark when they wake at night. They have a knack for waking up just as soon as the power goes off at night. I can almost time it. 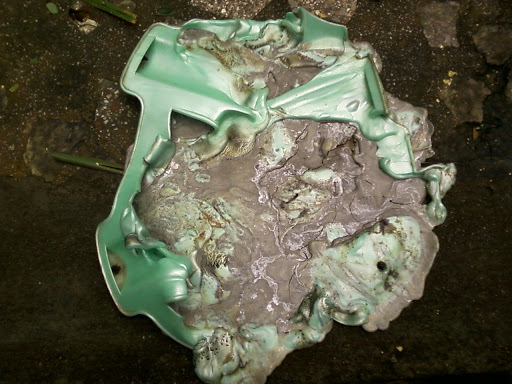 The candle was on a foam plate, which was on top of the hard plastic stepstool that always sat under the sink. I had a fleeting thought that maybe the plate would melt but I was sure the candle would go out before anything serious could happen since it was quite small. So I left it. About 2 hours later, I woke to hear Lila calling me. I got up and as I passed the hall, I could make out a ring of fire on the floor. The combination of the dark and no glasses limited what I saw but I knew what it was – the candle had melted the stepstool, something I didn’t think was possible. I dropped to the floor and blew it out before I was even fully awake and thinking straight. Thankfully there was nothing around it that could have caught fire but it did scare me. Because I couldn’t see it clearly, I thought it was stuck to the floor, but in the morning after it cooled, I found it wasn’t. See? This is all that is left of what was our stepstool, the one that all our kids have used to reach the sink, the one I sat on to shower when I was so pregnant that standing in the shower was uncomfortable, the multi-purpose, most useful item we had. It used to be a very sturdy stool. The power of a small flame at the end of a candle.